Pictured at the podium is Sandy Whisler from the grassroots group Citizen Advocates for Public Education based in Lake Mills, WI. Democratic legislative leaders Sen. Jennifer Shilling and Rep. Peter Barca have shown their election-year cards. They are banking that four major issues – support for K-12 public schools, support for the UW System, attacks on the state’s tradition of open government, and tax-code changes that favor the rich – will elect Democrats on Nov. 8. 1) K-12 public schools: Depending on whether state government faced a surplus or deficit, Republicans have cut and increased K-12 aid to public schools over the last five years. Democrats say those cuts in state aid – compared to their last budget in 2009 – have forced local school districts to close schools, end important programs and pass referendums to stay afloat. K-12 public schools, Democrats add, would be in much better shape if Republicans weren’t sending $172 million in tax funds this year to private schools through the statewide Choice program. It lets students from poor- and middle-income families attend private schools with state-issued vouchers. Here’s the bet Democrats have placed: When your kids go back go school in a few days, you will notice – and be angered by – larger class sizes and fewer books, computers and aides. It will make you vote for Democrats on Nov. 8. First, state aid to K-12 schools is the single largest general-fund expenditure in the state budget, and that won’t change. 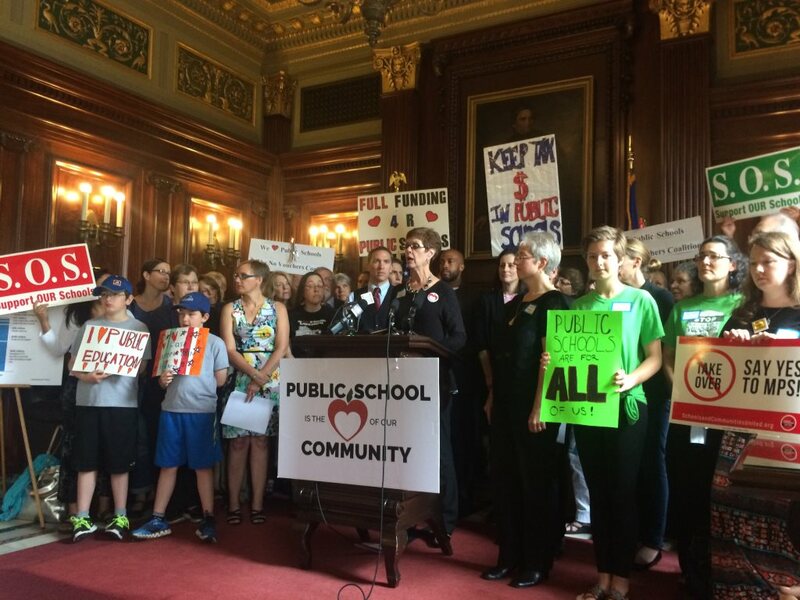 Second, the state Department of Public Instruction said this on July 1: “The $108.1 million bump in state general aid from Wisconsin’s biennial budget means 61% of school districts (260 of 424) will see an increase in state aid” next year. 2) Support for UW System: In 2004-05, state aid was 25% of total UW System spending. Now, state aid makes up 16% of System spending, and the current state budget included a two-year, $250 million cut in state aid for the System. As a result, all 26 campuses have cut programs, offered early retirement packages, not filled vacancies, laid off workers and made other costing-cutting changes. But, Democrats warn, all campuses – including the flagship UW-Madison – will be hurt significantly if Republicans continue aid cuts. Records showed that senior aides to Gov. Scott Walker pushed a plan, which was quickly dropped, to scrap the so-called Wisconsin Idea – the System’s historical mission to work on issues and problems statewide. Answering anti-UW System charges, Walker and other Republicans say they are pro-UW System parents, since they have frozen resident undergraduate tuition for four straight years and may freeze tuition for two more years – through the 2018 election for governor. 3) Open government: With Wisconsinites distracted by the Fourth of July holiday last year, all 12 Republicans on the budget-writing Joint Finance Committee voted to repeal an Open Records Law mandate requiring state officials to maintain official documents – a change that would have allowed Walker and legislators to keep those records secret. A firestorm of public backlash soon killed that change. But those 12 Republicans who backed the secrecy provision included three state senators who Democrats insist are vulnerable on Nov. 8. If these three are re-elected, having already showed their opposition to open records, look out for what they will try to pass next session, Democrats warn. 4) Tax-code changes for the wealthy: Democratic Rep. Gordon Hintz asked for an analysis of exactly which taxpayers will benefit from a new Manufacturing and Agriculture Credit, scheduled to cost $209 million when 2017 taxes are filed. The stunning answer: Eleven taxpayers who each have taxable incomes of $35 million or more a year will divide $21.5 million of that tax break – or $1.95 million each. And, overall, taxpayers with taxable incomes of more than $500,000 per year will get 88% of that $207 million. Elect us, Democrats say, and we’ll kill that tax break for the rich. A fifth powerful issue – how to pay for highways and infrastructure projects – doesn’t break along party lines. Many Democrats say they would raise the gas tax, or other sources of revenue, to avoid borrowing another $850 million in the next two years. Although Walker last week again insisted that no tax or fee increases are justified, two top Assembly Republicans – Speaker Robin Vos and Finance Committee Cochairman John Nygren – promised to develop their own long-term solution to the transportation funding crisis.